Which system best fits your business needs? What differentiates a periodic from a perpetual inventory management system, and which makes the most sense for your company? 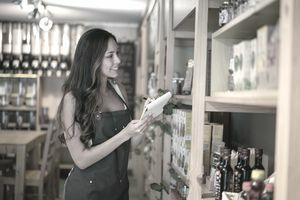 Most small businesses still use periodic inventory management, although perpetual inventory management has become increasingly popular due to the development of more sophisticated computer scanning of inventory, lower software costs, and increased software functionality. More and more businesses use barcode scanners at the point of sale. According to generally accepted accounting principles (GAAP), companies can choose to use either a periodic or perpetual inventory system. Understanding the difference between the two systems can help you figure out which method works best for your business. Periodic inventory management allows a company to track its beginning inventory and ending inventory within an accounting period, but it does not track the inventory on a daily or per-sale basis. These companies track their Inventory by having employees take a physical inventory count. Under this system, companies record all purchases to a purchases account. Once the physical inventory on hand has been counted, the balance in the purchases account is shifted into the inventory account, which in turn is adjusted to match the cost of the ending inventory. Companies calculate the cost of ending inventory by using the LIFO or FIFO inventory accounting methods, or other less common methods. Beginning inventory simply equals the ending inventory from the previous time period. Business types using the periodic inventory system include companies that sell relatively few inventory units each month such as art galleries and car dealerships. Additionally, smaller companies that don't have the staff to work with a perpetual system often use the periodic inventory system until they get to a point where the benefits of a perpetual inventory system outweigh the costs of installing the system. A perpetual inventory tracking system records adjustments to inventory balances after every transaction through point-of-sale inventory systems. This eliminates the need for the store to close down for a physical inventory stock-taking as perpetual inventory systems allow for continuous stock-taking. Perpetual inventory systems keep a running account of the company's inventory that updates after every item sale or return. Perpetual inventory systems involve more record-keeping than periodic inventory systems, which takes place using specialized, automated software. Every inventory item is kept on a separate ledger. These inventory ledgers contain information on the item's cost of goods sold, purchases and inventory on hand. Perpetual inventory management systems allow for a high degree of control of the company's inventory by management. Perpetual inventory systems provide the business owner with a record of detailed sale transactions by item, including where, when, and at what price items were sold. As a result, businesses can have inventory spread over more than one physical location while maintaining a centralized inventory management system. Even with a perpetual inventory management system, the company still needs to shut down at least once each year to do a periodic, manual inventory count. The scanned barcode sales data tell the business owner exactly what inventory should still be on hand. The company then compares the manual periodic inventory count results to the periodic data to determine how much inventory has been lost, stolen, damaged or subject to spoilage. If your business is small, using periodic inventory management may work for you because you can operate with just a cash register and simple accounting procedures. If you sell services rather than products, you may not need an inventory management system at all, unless you also have inventory such as food items, for a restaurant, or you are in the hospitality business. As your business grows, you may want to switch over to a perpetual inventory management system as it allows you to access the balance in your inventory account at any point in time. Large businesses typically have perpetual inventory systems rather than periodic inventory systems due to the large volume of inventory transactions and the computerized nature of the rest of their financial and accounting systems.